Welcome Simply Lovely Things (and a giveaway)! I am very happy to welcome Simply Lovely Things as a new sponsor on my blog. Colleen has written a lovely introduction to her shop and is offering a generous giveaway (more details at the bottom of the post). I am increasingly shopping from smaller shops with curated fabric selection, and Colleen has done a wonderful job stocking her shop with beautiful fabric. I'm so excited to be part of the Kitchen Table Quilting community! My name is Colleen Regan and I am 51 year old kind of crazy, a lot of OCD, list making, fabric lover, oh and of course quilter/sewer! After being a nurse for 30 years I really wanted to do something fun in my life. Although retirement is down the road, we thought that now was the time to start something and try and grow it into a retirement hobby business. My story is probably similar to many, I taught my self to sew at age 15 (I still have the dress pattern) and grew into a quilter. I totally love my sewing machine and really do all kinds of sewing. My favorite things are making small blocks into big quilts. I really love making free motion feathers! You can see my big Urban Beauty quilt here. It's hard to see, but the entire small square borders are all free motion feathers with silk thread. I really love taking something traditional and making it look fresh and new, maybe a modern vintage feel that seems so popular. I see myself continuing with free motion quilting and owning a long arm in the near future. So for my shop, I hope you love what I have to offer. I love that little bit of shabby, feminine, whimsical and fresh feeling. I am in the process of making an account with two new fabric companies, Moda and Maywood. I also am extremely interested in what the international market has to offer. I'm looking at Tilda fabrics, Lewis and Irene and carrying Jen Kingwell products. I am also traveling with my quilt shop and have applied to 4 Mancuso Quilt shows for 2018. I would love to hear about the items you love most and would love to see more of. I do carry a little bit of wool, felt, patterns and specialty threads. I know I don't carry 5,000 bolts but my goals to keep it a size where I can handle it myself. I personally stopped buying from fabric.com because my fabric was poorly packaged and folded strange and thrown in a box. So when you buy from me I promise its just me pulling that bolt, cutting it on my old hoosier cabinet(which by the way is a perfect height for cutting, mine is without the top), folding it, and saying that is so pretty I wonder what it will be? it's just me, crazy 51 year old Colleen! As for my personal life, I have been married to my husband for over 30 years! We have 3 children, Sam the oldest is in his second year of med school, Jacob our second is serving proudly in the Army, ( please pray for my baby boy as he is slotted to go to Afghanistan and is special forces) and my daughter is in her last year of college and applying for med school as well. I have been a nurse for 30 years and currently work part time in the Pediatric Emergency Department. Other than my sewing machine, I love transforming anything ugly into something beautiful, I am always doing something and if you're not careful I will throw some paint your way and see what I can do! In the year I hope to continue growing my business and working on my blog, I have so many ideas but honestly blogging is very time consuming. I have finally done several projects on my home that I hope to include. Im grateful and honored and look forward to hearing from you! 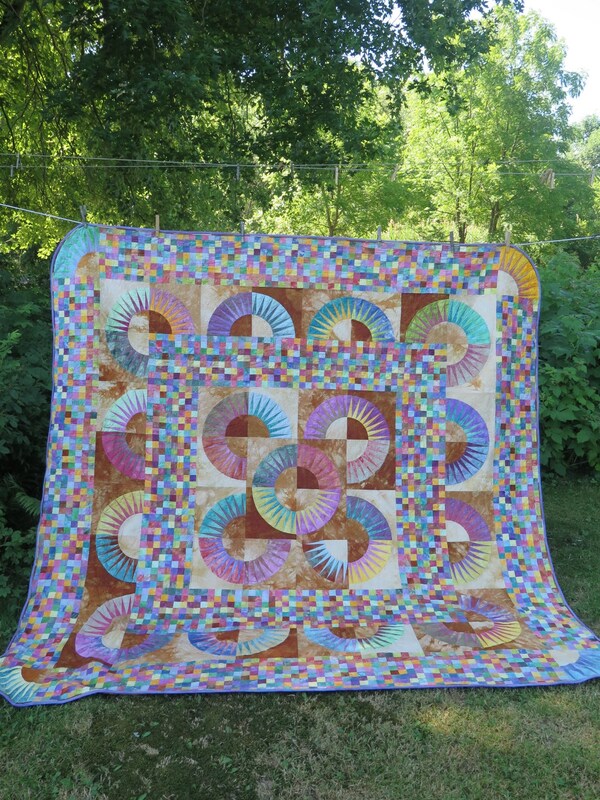 Colleen has generously offered a giveaway of 7 Fat Quarters from Nancy Halvorsen's Bree collection. To enter the giveaway, visit Simply Lovely Things and take a look around. Then head back here and leave a comment letting us know what your fabric item(s) are. The giveaway will go through Sunday night. The giveaway has ended, the winner is Kathy. I will send you an email so that we can get your fabrics to you! I really like the Folk Art Fantasy by Amanda Murphy. I love Carina Entwined in green! I love the black wedding rings fabric from Folk Art Fantasy. I haven't seen it before. Her prices are great too! So many great fabrics! Good luck with your adventures Colleen and thanks for the giveaway! I enjoyed browsing the shop. The Coming Up Roses bundle by Jill Finley is beautiful. I also saw some perfect scissors that need a home with me! I really hope the shop is successful. The little girl's skirt is so cute but I would love to have the gingham collection. Love the fresh new fabrics! The Contempo Carina bundle makes my heart skip a beat! Best wishes on your new venture Colleen. Praying for Jacob! I love the Windham Notepad fabrics. Good Luck Colleen! I love the Contempo Carina bundle. Yum! Good luck. I really like the Black Medallions fabric. Would be sew cute for a border on a quilt. thanks for the great giveaway. You do have some nice whimsical fabrics! I like the Nancy Halvorsen Bree, the Turquoise Rug, and the other turquoise prints! I liked the Forget Me Not bundle! What a lovely shop! I love the Blue Carolina bundle! Thanks for the giveaway! I am loving her wool selections! especially Wool Felt Blend in Buttermilk Basin Give Thanks Browns and Squashes! I started sewing 3.5 years ago, making clothes for my daughter. But, along with my sister, I recently started quilting. When looking for fabric for clothing I wanted fun bold prints, but now that I quilt as well, I appreciate simple patterns and solids. And I LOVE bundles. So many pretty bundles! I want to see what is inside that Bambi jelly roll! Riley Blake "Sweet Prairie" is a beautiful collection! HI,LOVE "Blue Carolina","Sweet Prairie","AGF Capsule Le Vintage Chic">NEAT SHOP!THANKS FOR SHARING A SWEET GIVEAWAY! thanks for sharing Simply Lovely. I like the Nancy Halvorsen, but also found some Art Gallery fabrics I love - Millifiori ** Effusion and amorous notes. I like the Pixie Christmas fabrics. Thanks for the opportunity to win! Hmmm, some very pretty bundles there. Those AGF Lilybelle FQs in teal and yellow are really yummy. Everything looks so pretty, it's hard to decide what I like best. But I was really happy to see the Sale Fabric department. Beautiful fabrics at affordable prices. I was really glad to see that. I love, love, love Riley Blake Designs Rustic Elegance 18 piece Fat Quarter Bundle. All the Buttermilk Basin, Fig Tree patterns and the wide selection of wool felt has me super excited. Good luck with your new undertaking. What a lovely, lovely store! I don't buy online very often, but more and more I do like the Esty stores best. I had to bookmark this site! What really caught my eye is the Art Gallery fabrics Agcua di Rose boho and Joie De Clair. Sooo pretty! Okay so I have a confession.... I love fabric. I just do. I love looking at it. I love buying it to have and to hold. And I especially love it when it's on sale. So I see plenty on Simply Lovely Things Etsy shop. Especially Benartex & Art Gallery prints. I liked the fabric on the top of the pile so much I went ahead and ordered a yard. I like the Black Medallions. Great fabric. I think Naivety Abloom Fusion fabric would be great as a background fabric for a quilt using the colors within for the blocks (ie blue pink yellow white). Urban Beauty is indeed a beauty! I've long admired the New York Beauty design, but don't think I'd attempt it with knowing the difficulty involved! Power to you for accomplishing this! One item I love is: Mineral tonal leaves cotton fabric by the yard from Josephine for Camelot fabrics. I need more tone-on-tones! Gray paisley-- and the quilt pattern! Your fabrics are all beautiful but I'm so happy to find a shop with such a great selection of patterns! I love the eight minis. Thanks, Colleen. Great selection of fabrics, loved the solid bundles best. Loving that leaf blender in light grey which would be a fabulous light background, but not boring like a plain white or cream. I love the Agcua de Rose Boho Fusion. Such a bold floral! I adore leaf blender fabric! I love Camelot Dinomite cotton fabric! Thanks for the chance to win! Folk Art Fantasy is adorable! Colleen, your shop is wonderful. I will certainly be buying from you soon. I love supporting etsy. I found a quilt pattern I like: Cluck. Luck Sew Vintage pattern. It's fat-quarter friendly — my favorite! Thank you for the opportunity to win! So much to love.... I had to Favorite your shop, Colleen, for future reference! I loved your curated color bundles of mint, orange sherbet and Aqua. I love that Bree fabric on the top of your giveaway bundle - what a great backing that would make for a ROYGBIV quilt! And the Mayberry Lane pattern.... a must-make for sure! Best of luck with your shop, and thanks for the opportunity to win. (PS - Fabric.com is the pits - I will never order from them after my 5-yd Kona white came with a dirty footprint on it and stuffed Willy-nilly in a bag). Nice to see some Maywood Studios and Lecien in Colleen's shop. None of the LQS carry those brands around here. The Sharktown bundle is my favorite. A little sweetness by Riley Blake caught my eye, but there was so much loveliness there! I like fig tree patterns and cluck cluck sew patterns too. I will have to bookmark this shop! Periwinkle Medallion cotton fabric from the Folk Art Fantasy collection caught my eye. I am into blues right now and bunnies! I like her prices better than brick and mortar shops! LOVE! that little stack of fabrics. Thanks for the chance. I love most Riley Blake fabrics....adore the solids!